Everyone, from adults to kids love chocolate. They will love chocolate cake even better. 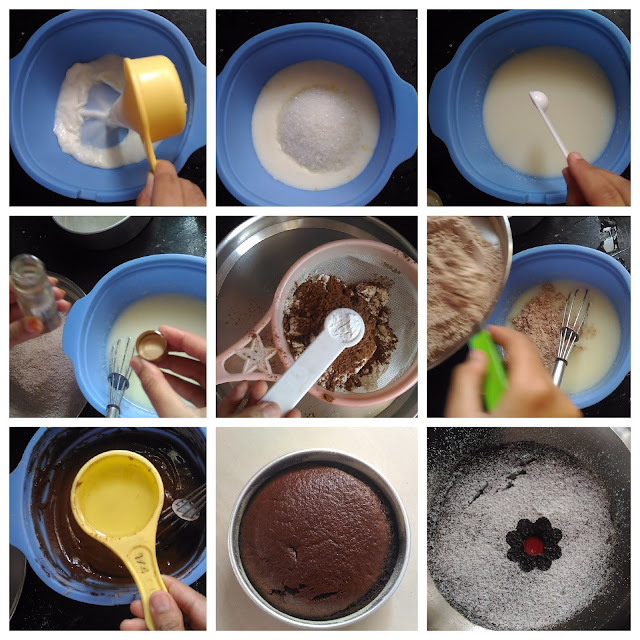 Chocolate cakes are easy to prepare even without egg. 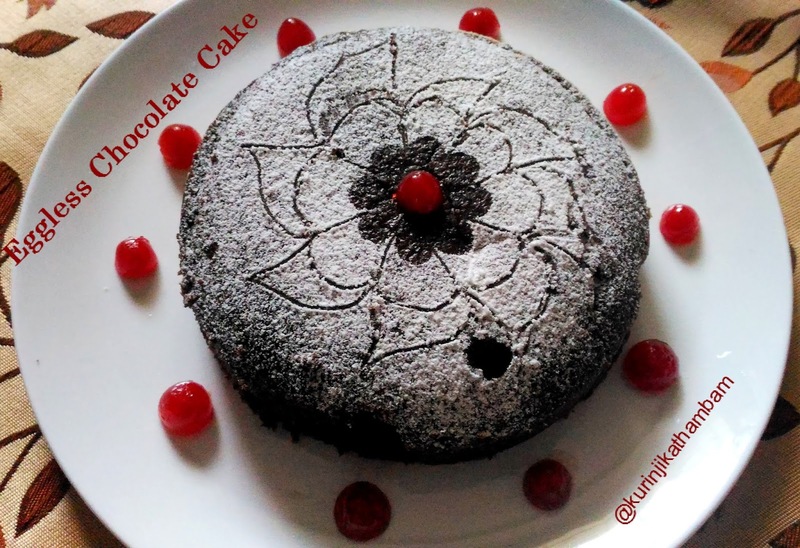 I am presenting a fool proof recipe which I have tried many times with very good result (Cake always spongy). Try this and win the hearts of your loved ones again. Click HERE for more Cake Recipes. 1. In a bowl, add milk, curd and sugar. Mix them well till the sugar dissolves completely. 2. Add baking soda with the above mixture and mix them gently. Keep it aside for 5 mins or till bubbles comes from the mixture. 3. Sieve wheat flour, coco powder and baking powder together for 2-3 times. Keep it aside. 4. Meanwhile, grease the baking pan with butter and dust with wheat flour. Keep it aside. 5. Add vanilla essence with the curd mixture (from 2). 6. Now add the sieved flour (from 3) little by little with the curd mixture (from 2). 7. Mix them well and then add remaining flour till all the sieved flour incorporate with the curd mixture. 8. Add oil and fold them gently. Cake batter is ready. 9. Pour the cake batter into the greased baking tray (I have used 7 inch round cake pan). 10. Pre heat the oven for 200 degree Celsius. 11. Bake the cake at 180 degree Celsius for 25-30 mins or inserted the tooth pick comes out clean. 12. After, immediately take the cake out from the oven. Allow it to cool down completely. 13. Remove the cake from the pan using the knife. 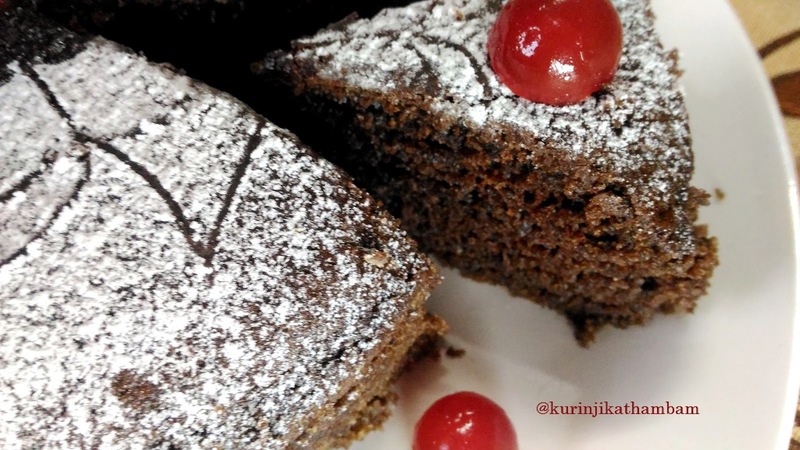 Really spongy and delicious eggless butter less chocolate cake is ready to serve. 1. Use 1 cup of buttermilk instead of milk and curd.